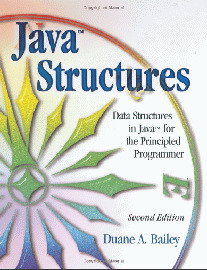 The √7 edition of Duane Bailey's "Java Structures" offers a fresh, compact introduction to the design of traditional data structures in Java. The book is supported by a book web site, where all code is posted for the book's examples, documentation, and the structure package. The book is the perfect size for students to grasp, with enough classes for the student/programmer to choose and appropriate data structure, but no so many as to overwhelm. The structure package is a complete, tested unit that forms the core of data structures that can be used in other applications students might write for other classes. It is a resource that students will make use of for several years of college. This book attempts to provide a fresh and focused approach to the design and implementation of classic structures in a manner that meshes well with existing Java packages.